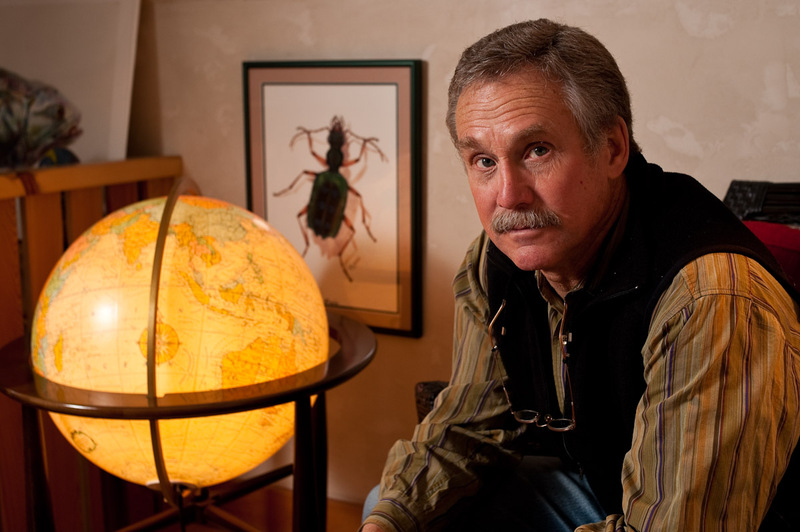 This is David Quammen, whom I photographed at his home in Bozeman for Montana Quarterly not long ago. Mr. Quammen only met me recently. I’ve know him for decades. I remember reading articles he wrote for Outside magazine. Articles about science, a subject I had struggled with in high school and college. But Mr. Quammen has a way of explaining things in a clear, and — this is important — interesting way. I read his stuff and not only do I get it, but I’m actually inspired by it. That’s a rare gift. Mr. Quammen has gone on to write a lot for National Geographic and he’s written some critically-acclaimed books as well, including The Reluctant Mr. Darwin, Song of the Dodo, and Spillover, which was excerpted in the winter issue of Montana Quarterly. If you think science is cool, but you’ve had trouble actually understanding it, Mr. Quammen is your guy. By the way, that beetle in the background is named for Mr. Quammen. Quammenis spectabilis is a beetle in Costa Rica named by entomologist Terry Erwin. Wow! I haven’t been that nervous on a photo assignment in a very long time. Beautiful work as always Thomas! you seem to be keeping pretty busy which is great! Thanks Jim! Great to hear from you. Well done. I’m a huge fan as well. I’ve read all his books and recommend them regularly. Excellent job!